In the Part 1, W2WK had a poll from readers on who had heard of the various Italian wine regions. Hardly anyone had heard of Friuli-Venezia Giulia or Trentino-Alto Adige. And the Veneto seemed to be slightly more well-known than the other two, but not by much! So hopefully, once you’re done reading this, you can confidently walk into the Italian wine aisle and pick out a northeastern Italian white wine and have a general sense of its expected characteristics. Where is it? As you may have already guessed, the Tre Venezie is in Northeast Italy. But for those rusty on their European geography, that means it borders Austria. When I think of Italy – I think sun and warmth. When I think Austria, I think of the Von Trapp family hiking through the Alps in the snow. Wine Know Take-Away: The Tre Venezie is on the colder side of Italy’s weather range. What does colder weather mean for winemaking? White wine grapes grow better in cooler weather than red wine grapes. Therefore, this region is known for its white wines – many of considered “world class” or highly rated. That said, the Tre Venezie produces both white and red… and some of its reds (including Amarone and Valpolicellas) are very well respected as well. General Characteristics of Tre Venezie White Wines: Given that this region borders Austria, much of its culture – including its winemaking practices – is more similar to Austria and Germany than it is to Italy. (And, you’ll find that many wines from Trentino Alto-Adige are actually labeled in Italian and German.) For winemaking, that means a lot of structure and precision in its winemaking. White Wine Characteristics: White wines from NE Italy are primarily dry, unoaked and have a lot of natural fruit flavor and acidity (therefore, they will not have that buttery or oaky flavor). The acidity gives these wines a bit of a spicy, earthy, and/or mineral characteristic, while having a noticeably fruity flavors such as green apples and peaches. Many wines, particularly from Friuli, will have an almond or vanilla flavors as well. Prosecco, the famous sparkling wine from the Veneto, has a touch of sweetness. Red Wine Characteristics: The cooler weather of this region tends to produce lighter, fruitier red wines that can be quite refreshing and sometimes even a bit bitter. (These are the kinds of wine I love for a hot afternoon happy hour with some light food.) Reds from the Veneto will have some cherry flavors and can be a bit spicy. Amarone: The exception to this light, fruity generality is Amarone. This wine is made in the Veneto and is an intense, sometimes syrupy wine that is made from over-ripened grapes. They are picked later in the harvest and then laid out on racks to dry out even more. This allows the sugar and flavor of the grape to become more intense (as the grape loses its water). Amarone will be very rich, have flavors of licorice and dried cherry. The Tasting Double-Take: As I indicated in Part 1, I had not tried many Italian wines before starting to work with some Italian wine-focused companies. And while I like white wine very much, I tend to drink red wines more often. That said, the Italian whites that I’ve tried from northeast Italy make me think they can be a red wine drinker’s white wine. They are more interesting in that there is a different level of complexity to them. Do you ever get that “flat” flavor from some white wines (and red wines too, for that matter)? … The ones that taste a bit like fruit juice with an injection of alcohol? These wines aren’t like that. They develop while you’re tasting them. Like a wine sip double-take…. You know how you sometimes have that reaction to wine – the initial reaction is “oh yum”, and then about 4 seconds later as that sip of wine has made its way through your mouth, your reaction changes to “Ooooh yu-uuuummmm.” Well, that’s what I mean when I say the wine develops as you drink it or when I think it is “interesting”. The below image shows all the regions that are qualified “DOCs”. 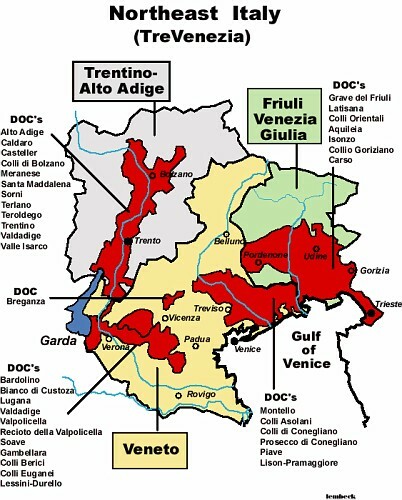 Any wine that is labeled with one of these terms will be a wine that is true to the characteristics of that particular sub-region within the Tre Venezie. If you come across an Italian wine store, you’ll find a much greater variety, but I found that even here at my local Total Wine, the selection of northeast Italian wines is fairly limited with the exception of the pricey Amarone and plenty of selection of Valpolicella. Coming up!! Later this week I will post a new Virtual Wine Pairing Dinner Party that will include food pairing to wines from northeastern Italy! Hopefully this will get us all out to experience this wine together!! It’s time for another Did You Wine Know – Country Series on W2WK! This country series will be featuring Italia! As I mentioned in my previous post, I have been exploring the wine industry over the past few months… and my wine gigs have been all about Italian wine. I have worked in an Italian restaurant with a mostly Italian wine list… and with a local distributor who sells only Italian wines. But I must admit, I had rarely purchased / tasted Italian wines before these gigs. I guess I avoided the Italian wines because I didn’t know quite what I was getting with any bottle. I didn’t understand the label enough to know if it was going to be a soft/light red, or a bold/juicy red. And I would guess that many of my Wino friends have a similar “avoidance” practice with Italian wines. I hope that this Country Series gets all of us to explore that Italian wine aisle more frequently. For me, this will be a helpful step in my journey to become a bit more fluent in the Italian wine lingo. 1. A five-part series over the next several months that highlights info regarding the different wine regions of Italy. 2. A Virtual Wine Pairing Dinner Party to follow Part 2, 3, 4, AND 5! If you haven’t participated in a Virtual Party before, don’t worry – it comes with instructions. Production: Italy is THE largest producer of wine in the world. (Does this surprise anyone else? When I learned this, I was a bit ashamed to call myself a Wino since I really haven’t had much Italian wine.) Being the largest producer of wine means that Italy contributes about 17.5% of the GLOBAL wine production. Considering the size of the country (which is just slightly larger in area than the state of Arizona), that’s impressive. 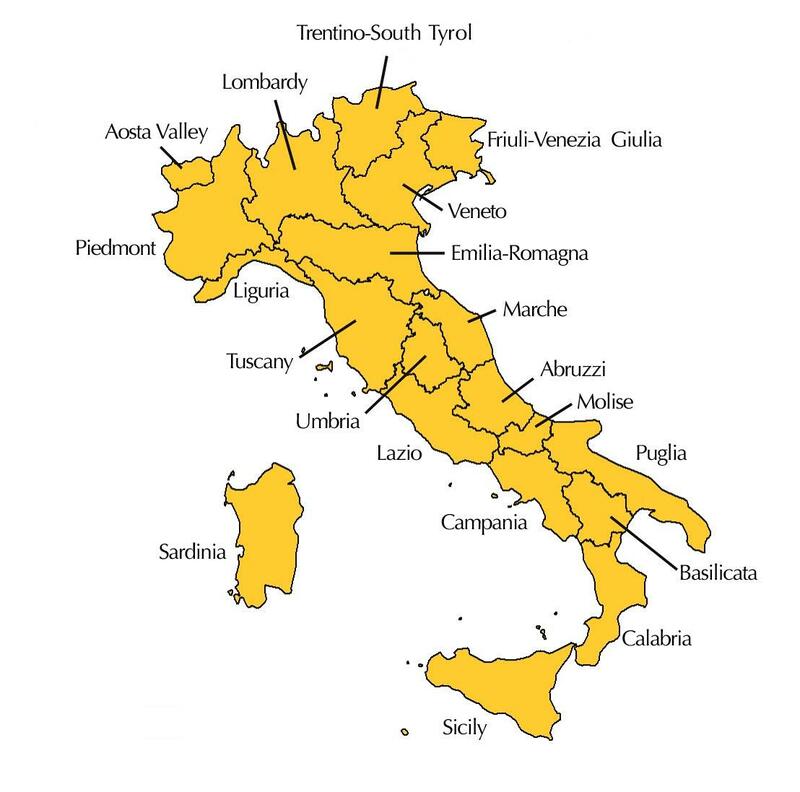 Now that you’ve submitted your Wine Know, here’s a little map of Italy’s wine regions. You might recognize some of the names from Italian food products as well. The food regions, wine regions, and political regions are all the same in Italy. Wine Classification: Italy has 3 key steps in their wine classification, which means that on any Italian wine bottle label, you’ll see one of these 3 terms. VdT: Vino di Tavola. Wines marked VdT have the least restrictions on the grapes used and winemaking process (making it the lowest quality of wine). In the U.S., we’ll won’t see a ton of VdT wines – but you’ll find them all over the place in Italy for just a few Euros. IGT: Indicazione Geografica Tipica. IGT wines have some restrictions with regard to the grapes used and winemaking process to ensure the wine has characteristics that are typical of that geographical region. They are more strict than the VdT, but do not have as many requirements as wines labeled DOC/G. DOC/G: Denominazione di Origine Controllata (e Garantita). DOC and DOCG are the highest quality wines from Italy. Wines labeled either DOC or DOCG must abide by the most strict requirements. In order to label a wine with DOC or DOCG, the winemaker must grow the grapes in specifically approved areas, use certain grapes, have a maximum yield of grapes per hectare, follow specific pruning and winemaking practices, among other requirements. Generally speaking, DOC/G wines will be more expensive than IGT wines. But there are plenty of high quality IGT wines that are in high demand (many “Super Tuscans”, for example). Also, keep in mind, that DOCG quality classification doesn’t mean it is going to taste great to you. It just means it is more likely to have the characteristics typical of wine from that region. Wine from Italy is named after its region. For example, Chianti is a specific region within Tuscany. Chianti Classico is a smaller zone within the Chianti region. And both the Chianti and Chianti Classico regions are designated as DOCGs. So when you buy a bottle of Chianti, you know that it has followed some pretty strict guidelines with regard to how it was made… However, the label might not have a list of the grapes used to make the wine. You would just have to know what grapes are permitted in making a wine from Chianti. The Grapes: There are SO MANY grapes used in Italian winemaking. And the vast majority of them are grapes that none of us have heard of. For example, Corvina, Rondinella, Molinara, Erbaluce, Bosco, Bonarda. The list goes on and on… The good news is that each region has some key grapes – I’ll highlight some of those in the follow-on blog posts in this series! So those are the basics… next up is a look at Northeast Italian wines – that post will be accompanied by a Virtual Wine Pairing Dinner Party. Get ready for the virtual fun! Yes, my friends. I filled my head with so much Wine Know in one week, that I petered out on W2WK posts!! But in case you are wondering, I did actually finish the course… and passed it! Even though I am a few days behind, I wanted to round out the wine fun fact sharing with some additional randomness I learned on days 5 and 6 at the International Wine Guild. Did you know that winemakers can fly!? It’s true. They just need the same silly jet engine machine that the rest of us do. But a “Flying Winemaker” is a person who travels to different regions of the world to make wine from multiple harvests in one year. Most winemakers (who stay in their home region) will make wine only one time each year (starting at harvest). A Flying Winemaker travels to different regions on different hemispheres or climates to be able to hit up multiple harvests and get to build their own Wine Know 2-3 times in one year. This will blow your mind. China is the #5 producer of wine in the world. Now that I think of it, it probably shouldn’t be all that mind blowing, but I think most of us do not consider China a big piece of the wine world. They don’t consume very much (they rank #125 in consumption), but #5 in production!? Who knew!? When most of us snag a Malbec from our local wine shop, we are usually looking at a bottle from South America – most likely Argentina or Chile. But did you know that the Malbec grape is actually native to France’s Cahors region? As discussed in the France Country Series posts, French wines are typically blends of various grapes, so you don’t often see the grape names on the wine bottles. In 1885, Australian Shiraz won 1st place at the Paris International Exhibition (or the Paris World Fair). This would ordinarily have been a huge deal (you know – placing above France in a wine contest). It’s just that it was a bit out-shadowed by that little thing we’ve come to refer to as the Eiffel Tower, which was revealed at the fair in the same year. This one is more of an un-fun fact. 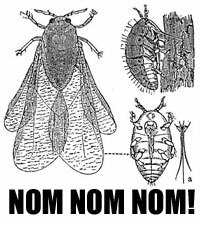 Phylloxera is a root-feeding aphid (nasty little insect) and is native to North America. Vines that are native to North America live peacefully with this little bug. But guess what – phylloxera isn’t so keen on making international friends. Instead, it eats them. Through the late 1800s, phylloxera quickly spread across Europe to the point that by 1890, 99.9% of all European grape vines were completely destroyed. NINETY NINE point NINE percent! Can you believe that? Luckily, someone thought to graft together the European vines with vines native to North America. This basically means that the root of the plant is North American (and therefore living in peace with phylloxera) and the top of the plant is whatever you want it to be. (For more on grafting, check out one of my very early W2WK posts here…). And the replanting began. I just can’t imagine a world without European wine… but we came close to it. So there it is, Winos. This concludes the fun fact sharing from my fantastic experience at the Wine Guild. Of course, I will be using my newly acquired Wine Know in future posts – hopefully in a bit more focused manner. But I hope you enjoyed these and like I said on Day 1 – I really hope someone wins some trivia game because of what they’ve read here!! 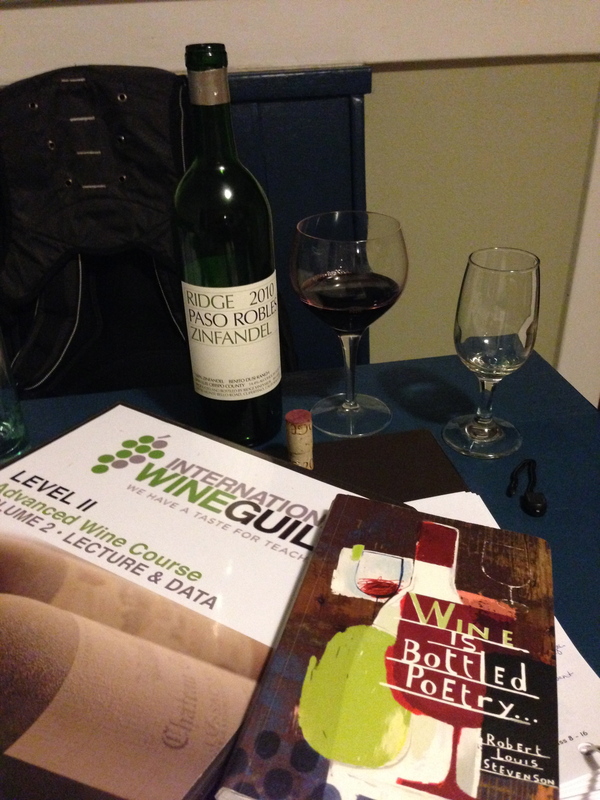 Winos… I’d like to confirm that it is so damn fun to spend the whole day talking about and studying wine. Before I get going with today’s fun facts learned from my lessons at the International Wine Guild, I’d like to mention that I corrected some info regarding reserve wines in my previous post. Legal definitions/requirements for the word for “reserve” exist for five countries, not just one. See that post for more details…. The movie Sideways, which came out in 2004, made a huge impact on the U.S. wine industry. The main character talked extensively of the greatness of Pinot Noir and his personal disdain for Merlot. After that movie, Pinot Noir sales jumped by 50%… Luckily, Merlot didn’t decrease – and they actually still increased in sales by about 5%. Pinot Noir was not planted in Oregon until 1965! In fact, the U.S. really didn’t get into winemaking until the 1980s after Chateau Montelena (a California winery) won a blind tasting in France in 1976. (Watch the movie Bottle Shock – it tells this great story!) Soon after, vineyards began to take root and winemaking started to flow. (Both puns intended because I’m feeling annoying.) Anyway, northern California went from having a handful of wineries to hundreds in just a few years. Strange to think this country hasn’t been making wine on a large scale until the last 35 years. PS: I should really be focused on preparing for my quiz tomorrow (while enjoying this gorgeous bottle of Ridge Zin). But I’m so entertained by these random bits of wine know, I just had to share! (NOTE: I updated this with a correction since my original posting!!) When you see “Reserve” or “Reserva” on a wine label, with a few exceptions – it pretty much means nothing. At least not legally. There aren’t any common labeling laws that dictate the criteria to call a wine a “reserve” wine in most countries. Therefore, it is defined on a vineyard by vineyard basis. Only the following FIVE countries have a legal definition and labeling law for “reserve” wine – and in general, it is defined by wine that spends half its aging time in oak and the other half in a bottle. The five countries are: Italy, Spain, Portugal, Argentina, and Chile. Generally, the best times of the day to taste wine are from 10:00am-3:00pm, and 7:00-9:00pm. This has to something to do with our body chemistry… Screw happy hour – grab a glass at lunch! Yesterday, I noted the annual production of wine in France (1.62 Billion gallons) and the U.S. (only 711.2 Million). Well, today I learned that Italy is the #1 producer of wine in the world – just above France at 1.64 Billion of gallons of wine per year. Bravo Italia! In the 19th century, champagne was bottled with about 5 atmospheres of pressure which is what gives the bubbly the bubbles. (Today, most sparkling wine is still around that – some more, some less.) However, back in those days, the glass bottle that held that champagne (and its bubbles) could not support the pressure. So half or more of the bottles in a case exploded. Which means the poor guys who had to go down into the cellar to retrieve champagne had to wear protective gear to avoid the shrapnel that would be caused by the exploding bottles upon touch or movement! Who knew wine could be so dangerous. In the later 19th century, glass bottles were innovated to be strong enough to withstand the pressure of champagne and no longer explode on touch! Some Italian wines are labeled in German or French instead of in Italian. Warum? Pourquoi? Because some of the regions that are now a part of northern Italy were once a part of southern France or Austria. While the political boundaries were changing, grape growers and wine makers remained hard at work… and the label stuck. Or shall I say, es stecken. I will keep the fun facts coming as the week continues! Welcome to the final post in this three-part “Did You Wine Know” Country Series. The previous posts were background info leading to this post. In Part I, we talked about the overall wine quality/classification system in France. Part II covered four of 14 wine regions of France. And at long last, in Part III, we’ll jabber a bit about food pairings with wines from the four regions. Use the wine IN the food to make a sauce or marinade, etc. Assuming you make a mean sauce, drinking the same wine used in the sauce will be an instant pairing success. Complement the flavors of the wine with the flavors of the food. This is basically matching similar flavors – sweet food with sweet wine, fruity with fruity, etc. Contrast the flavors of the wine with the flavors of the food. So having a salty dish with a sweet wine, or a highly tannic wine with a fatty/buttery dish. I know for me, picking out the right food to go with your wine (because, let’s face it – that’s what anyone reading this post is actually doing) comes easily. But more often than not, it’s a bit of a guess. We often aren’t very well-versed in articulating the flavors of wine, or anything really. (For reasons discussed in this post…). So while we know we really like a particular bottle, it’s hard to say, “This wine has these flavor characteristics, and my food has those flavor characteristics, and therefore they will pair well together.” (Note: I wrote that using my “know-it-all” voice – like a local newscaster.) Anyway, part of my continuing journey to better understand wine is to better understand pairings. And in order to do so, I’ve got to improve my ability to articulate the flavors I taste in my glass. Recap for Part II: Bordeauxs are mostly red blends (usually including cabernet sauvignon, merlot, and cabernet franc), gentle complexity, elegant, not big in flavor. Remember that Bordeaux is on the west coast of France and became the wine that was shipped off to England back in the day. This and back in the 1100s, the mighty Eleanor of Acquitaine (from Southwestern France) married King Henry I of England. And a strong relationship between England and Bordeaux was born. England got Bordeaux’s wine and Bordeaux got England’s food. You lucky Bordelais!! !” (Note: That was my sarcastic voice… no offense, British friends.) The people of Bordeaux may or may not agree with the fact that their dishes were influenced by the English. But a standard meal in this region includes roasted chicken, roasted lamb, potatoes, green beans. And guess what – it pairs very well with a bottle of red Bordeaux wine. Wino Aside: I find this historical influence on wine rather interesting… and it also helps me remember that Bordeaux food is tasty, but not complicated. And therefore I should drink Bordeaux wine with tasty uncomplicated food. As noted above, lamb is also a classic red Bordeaux pairing. Sheep graze the overall region and feed on the grass between the grapevines. It is said that this gives the sheep an especially tasty flavor. Other common foods of Bordeaux that pair well with the white wines include Roquefort cheese (which is a sheep’s milk blue cheese) and foie gras. The sweet white wine from Sauternes (a sub-region of Bordeaux) is a great contrast to the Roquefort cheese. The dry whites of Bordeaux’s Graves sub-region pair well with salty seafood like oysters. Recap from Part II: This region is spread out and therefore has great variety in its wines, but the general characteristic across the board is that they are zesty and brisk wines. The western coast produces dry whites, the central area produces pretty much all kinds of wines from sweet to dry reds and whites, and easter Loire produces primarily dry white wines and some dry reds. The western coast of the Loire Valley, being on the water, has a strong culinary culture and tradition with seafood. So it only makes sense that the wines from the western Loire Valley were developed to go with seafood. They are minerally and dry whites that, when paired with a salty seafood dish, bring out the flavors of both the wine and food. As we look more towards the central and eastern Loire Valley, we find more variety in the white wines where they are made with Chenin Blanc or Sauvignon Blanc. These wines are high in acid – they are dry, crisp, and refreshing in flavor, which makes them very flexible with food pairings. This region is along the river and therefore accompanies a freshwater fish dish very nicely. The high acidity complements salads nicely and contrasts with creamy cheeses. They will also pair well with roast duck or grilled salmon. So – basically, try these wines with whatever you want! It’ll probably go! Recap from Part II: Burgundy is the easy one to remember – the two primary grapes are Pinot Noir and Chardonnay. Recap from Part II: Red Rhone Valley wines are big and spicy! The Rhone Valley is in southeastern France. Since these wines are big and spicy, they will pair well with the earthy, gamy flavors. Try Rhone reds with roasted lamb – it will accompany the intensity of that gamy/earthy flavor. Rhone reds will also pair beautifully with strong cheeses (blue cheese, goat cheese, etc) and charcuterie plates. Winos… All of this barely touches the surface of the wines of France (remember, this covers only a little about only 4 of the 14 regions). And even less of the surface for wine and food pairing. But I hope you feel like you have a slightly better sense of French wines… I know that I have plans to hit up the wine shop and try some of these combinations. But the bottom line with any wine is – if you like it, drink it! And then experiment with it – try that wine with different dishes and see how it brings out different flavors of wine. Try a wine with a seafood dish and a roasted chicken dish and see what happens. There are no rules with any of this – just a whole lot of experimenting to figure out what makes your palette pop with delight! Bonjour à mes collègues amateurs de vin! (And thank you, Google Translate.) It is time for Did You Wine Know France Country Series Part Deux! As a reminder, this is part of a 3-part series covering some basic Wine Know of France. As you may have noticed, while strolling around your local wine shop, French wines do not have labels splattered with the name of the grape used to make the wine. They are known by the region from which they come. It comes down to “terroir”. Terroir: Terroir is a French term and we don’t really have an English word for direct translation. It is is the grape growing environment that is influenced by climate, sunlight (and orientation to the sun), soil, slope of the earth, elevation, rainfall, wind, fog, temperature, etc. It is the sum of everything that influences the growing of grapes. Wines from a particular terroir have flavors in the wine that are associated with that particular location (as in plot of land). Every vineyard in France is said to have its own terroir. Technically, one (with a very well trained palate) should be able to taste a wine and recognize where it is from because it should taste like it came from that region. Terroir is embedded in the culture of French wine. We might say it defines the French wine culture. The classification system is based on this concept – a vineyard must show that there are flavors that are typical of the land on which the grapes grow (from that terroir) in order to be classified in the wine system. Wino Take-Away: Terroir is très important to building your French Wine Know. Wines from a particular region have characteristics that are typical of that region. Regions: There are 14 official wine regions of France (a designated wine region must be part of the AoC/AOP classification system, as discussed in Part I.) There is SO MUCH to know about French wines – I mean, they have books that cover just one region or even one vineyard with lots and lots of history and meaning. My trusty source for much of my Wine Know (The Wine Bible) dedicates 200 of its 900 pages to France and its regions. But here on W2WK, I intend only to whet your appetite on the topic and will spend about 800 more words on the topic. The below image shows where France’s 14 wine regions are located. In today’s post, I’m going to highlight the types of grapes grown in just four of these regions. Because of the strict regulations in the French wine classification system, only certain grapes are allowed to be grown in certain regions. For example, winemakers in Bordeaux aren’t allowed to plant just any old grape, make wine, and call it a Bordeaux. They must use the grapes permitted by the system. Since we American Winos primarily choose our wines based on the grape varietal (merlot, cabernet sauvignon, chardonnay, etc), we get a little squeamish around wines without this info on the label. I tend to wander into the French wine section at the store and look around wondering if “Chateaux blah blah blah” is going to be light or heavy or bold or fruity…. I never know! But hopefully this breakdown of some of the French wine regions will give us a start and knowing what to go for in the wine shop. Other “supporting” grapes used minimally to blend wines include Malbec, Petit Verdot, Muscadelle, and Ugni Blanc. Historical Fun Fact about Bordeaux: Because this region is on the waterways of France, in the 13th/14th centuries, Bordeaux wines were being shipped off to places like England. And as the English (among other countries) became accustomed to the joys of Bordeaux, its success and familiarity grew faster than most other French wines. Wino Take-Away: Bordeauxs are primarily a blend of the major and minor grapes grown in the region, which brings about a gentle complexity. The Loire Valley: The Loire is the most diverse wine region in France as it grows many different grapes. As you can see in the map, it is a long strip of land from west to east. The region has a cool climate and experiences temperatures at some of the lowest points at which grapes can ripen. “The signature characteristic of all Loire wines is their zesty acidity.” (The Wine Bible) For The Loire Valley, different types of grapes are primarily used in different parts – so I’ll highlight the grapes not by red vs white, but by the regions within the region. The interesting historical influence of The Loire Valley is that it used to be the vacay spot of Kings and their courts in the mid-20 century. They’d ride on down from Paris when it got too hot and went to hang out in The Loire. And what does one do on vacation?? Eat and drink too much, of course. So Loire Valley wines were developed to accompany food from that region. For example, the Western Loire Valley – which is on the ocean – produces wines that you will likely enjoy most when consumed with a seafood dish. Wino Take-Away: Loire Valley wines are widely varied with many grape varietals, and may be most enjoyed when paired with food. Drinking a good Burgundy may conjure ethereal feelings, so one might think there is a complex blending methodology used to bring about great balance. (No wait – we already learned that happens in Bordeaux.) Burgundy has only TWO major grapes. Wino Take-Away: While Burgundian reds are all primarily made from Pinot Noir grapes, they vary greatly in flavor and complexity from vineyard to vineyard. But a good red Burgundy may have you floating on cloud nine upon tasting. Because these wines are so big and bold, a good red Northern Rhone wine will age very well – upwards of 50 years! (Who on earth can save a bottle for that long!?) Something to keep in mind when you have things to celebrate 50 years down the road… I guess my 85th birthday is probably worth celebrating… hmmm. Something to think about. Wino Take-Away: Red Rhone wines are big and spicy. There are TEN MORE wine regions of France. As you can see, it takes a lot of Wine Know to get a feel for each region’s characteristics (or terroir) as represented in wine. For me, I feel like I have a slightly stronger understanding of at least these four regions now, and won’t have to pretend (as much) that I know what I’m doing in the French wine aisle. Next up in the Country Series is going to be more about pairing food to these wines. I felt like I just posted something yesterday here on W2WK. But upon logging in, I saw that it has been 1 month and 9 days since my last post. Yikes. (I just slapped my own hand and said, bad blogger!) Oh well. The good news is, new Wine Know has arrived! Welcome to my first Country Series post! (DYWK = Did You Wine Know… one of my blog categories) Here’s what I’m thinking about with this and subsequent posts in this series. I’m thinking that enhancing my educational journey of wine via this blog requires me to know a little something about the wine producing nations of the world…. AND what differentiates them. I want to be able to say, with some confidence, “Oh I just LOVE wines from [insert country] because of [insert valid reason].” Thus the reason for this series of posts. Quality System: Before we get into the weeds of France’s quality system, you – like I – may be wondering what is a quality system? Basically, it is a set of legal requirements that a particular region must abide by when producing and labeling wine. Each region has its own thang. Throughout the European Union, all wine producing countries have the same basic quality classification, which requires two steps or classifications; each winery must (1) produce table wine and (2) produce “quality” wine from a named growing area. Table wine has less restrictions placed on it than quality wine. Such restrictions can include things like the type of grape that can be used to make the wine, quantity of wine produced, amount of alcohol in the wine, etc. All in all, the higher the quality classification, the more restrictions there are in the wine making process. French Quality System: France meets the EU’s two required steps and raises it to… “complicated”. There’s the old system which has been around since 1935, and a new system that started to “roll out” in 2010. Vin de Table (VdT) – the lowest quality and least regulated wine in the system. Well, it’s still heavily regulated, but the restrictions aren’t as strict. Vin de Pays (VdP) – slightly higher quality than VdT but not as fancy as VDQS or AOC wines. They are more regulated than VdT but not nearly as much as VDQS or AOC. Vin Délimité de Qualitié Supériéure (VDQS) – these are wines that are basically on the waiting list to be considered an AOC wine. Quality is high, strictly regulated, but hasn’t achieved AOC status yet. In fact, wineries have to wait 25 YEARS and continue producing wine classified as VDQS before they can be CONSIDERED FOR AOC status. The French DO take their wine seriously. Appellation d’ Originé Controlée (AOC) – these are the cream of the crop and they rise to top… of the wine quality list in France. (I hope you are rapping these words to yourself now.) If you have a bottle of AOC wine around, you probably spent some good money on it and you better make an event out of drinking it. In summary, VDQS, AOC, and AOP wines are pretty fancy. VdT and VdP are less fancy. Choose wisely based on your night of wine-ing. 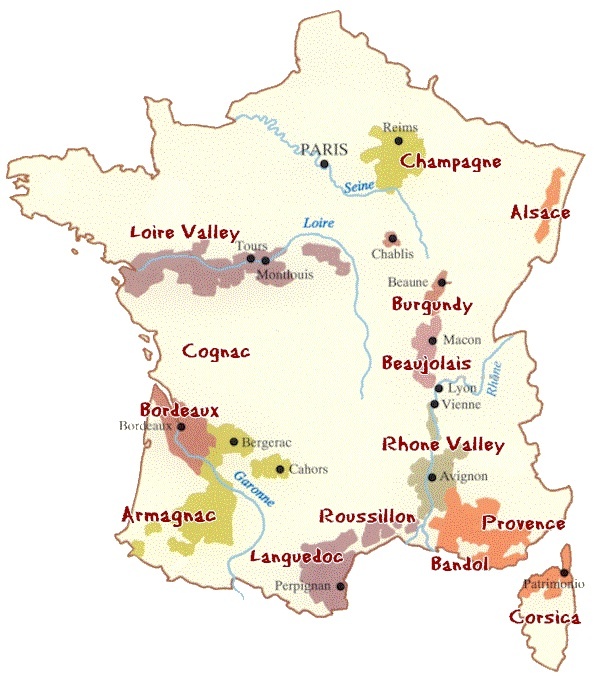 Area of Production – All wine areas are well defined in France and known as an “appellation”. To be in the IGP, AOC, or AOP classification, the grapes must be from that particular area. Variety of Grape – Each appellation has only specific grapes it can use to make wine. Yield per Hectare – There is a designated amount of wine that can be produced in an appellation. Vineyard Practices – This has to do with things like pruning the vines and irrigation. For example, AOC/AOP wines are not allowed to be irrigated whereas IGP/VdP and VdT wines are. Degree of Alcohol – There is a minimum and maximum level of alcohol permitted for different wine classifications. AOC/AOP wines have an average of 11% and VdT has an average of 9% alcohol. Winemaking Practices – Different practices are regulated (in order to be classified in the system) and includes things like wine aging requirements, etc. Tasting and Analysis – This is a chemical analysis that all AOC/AOP wines must go through to ensure they actually taste like the appellation from which they come. That concludes Part I of this Country Series. And it’s a lot of info to digest – hopefully you made it this far into the post! Between now and the next Country Series post (next Wednesday! ), go to the wine store, look at the French section and see what you find with the different classifications on the labels! Source of Wine Know in this post primarily came from: The Wine Bible and The International Wine Guild.